You will start receiving spam messages automatically if you share your primary email address everywhere on the internet. To get rid of spam messages you can use disposable email address. Give your disposable address when you don’t want to give your primary email address. 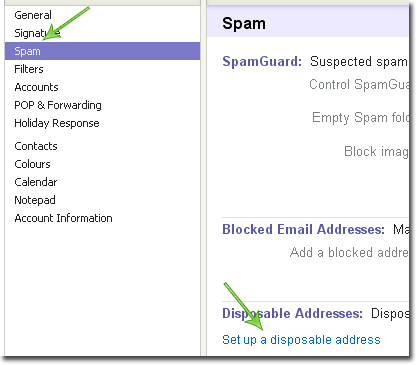 How to create disposable email address in Yahoo Mail Plus? Click on the Options on the right side of your Yahoo mail box. A new page will open, Click on Spam and then on Set up a disposable address. Now click on Get Started Now button on the left side. If you want to take the tour of AddressGuard, then you can click on Take a tour of AddressGuard. Now follow the instructions as given there and create a disposable email address. Now you can use this disposable email address that you created just right now to protect your primary email address from spam.